If this card is in your Graveyard during your Standby Phase and there are no Spell or Trap Cards on your side of the field, you can Special Summon this card to your side of the field. This effect cannot be activated if there is a face-up "Treeborn Frog" on your side of the field. The best card out of Shadow of Infinity. PERIOD. This is the toned-down version of Sinister Serpent. 100/100 1-star that's a free Special Summon if you don't have any S/Ts down at the Standby phase. You can't use it if you have another one on the field already, but this most likely won't matter because it's almost surely getting restricted to 1 over here (eat it, Soul Control.) Obviously, you'd use this as Tribute fodder for something with Monarch in its name to generate advantage. If it wasn't for the future restriction, we'd see 12-monarch decks running 3 Treeborns swarming the metagame. And then we'd see Chain Disappearance take out the Treeborn Frogs and we'd laugh. After getting Sacred Beasts for resale value, anyone who went to the Sneak Preview last month probably made this their next priority in picking up. We'll see what the new format says in regards to Treeborn's playability, but undoubtedly we'll see at least a little boost for Monarchs no matter what the restriction (or lack thereof). Stats: Treeborn Frog is a Level 1, which means it is easy to Normal Summon, slips under things like Level Limit-Area B and Gravity Bind. It won’t add much for Ritual Summons and can be used with Metamorphosis to get Thousand-Eyes Restrict. It is a Water Monster… which is good. Abyss Soldier can use it for discard fodder. It’s not much, but it’s something. Of course it’d be extra sick if it were Dark or Light (and thus Chaos food). If they are ever foolish enough to bring back Tribe-Infecting Virus then being an Aqua Monster will be useful. Otherwise it’s just sort of there. The ATK is a paltry 100 points, as is the DEF. This card is not being played for its stats, though at least they are highly searchable (Mother Grizzly, Sangan, Last Will). Effect: Treeborn Frog does one thing and does it well: it keeps reviving itself. So long as you have no Spells or Traps on your side of the field, you can Special Summon this card from your Graveyard during your Stand-By Phase. It’s simple, but quite, quite useful. Even though it’s puny, it can block an attack and is Tribute Fodder. Combinations: This card isn’t for all decks, but for the one’s it fits in it is quite welcome. Monarch decks obviously love it: yes they may need to cut back on non-chainable Spell/Traps and/or that remain on the field, but most they’d still consider are potent enough not to matter: Mirror Force is a 1:1 trade outside of a few Monster effects, and if they aren’t using S/T removal on it (still a 1:1) they lose a Monster for an S/T. If it blocks Treeborn Frog, it’s okay because at the very least you’re still protected. And you aren’t apt to play it until after they’ve burned some S/T removal. Same reason you still run Call of the Haunted and Torrential Tribute with Treeborn Frog. What might go are cards like Sakuretsu Armor, a 1:1 trade if they attack into it, and not as helpful if they can Special Summon an extra Monster. There are many, many useful and highly “chainable” Spell/Trap cards you can use: old favorites like Waboku and Threatening Roar. Enemy Controller is another likely candidate, since aside from classic defensive uses, you can revive a Frog, activate Enemy Controller from hand (still in your Stand-By Phase), sac the Frog, “borrow” an opponent’s Monster and revive Treeborn Frog again. The thing to remember is that as long as it’s worth having “insurance” of a small Monster should your S/Ts suddenly run dry it still might be worth running Treeborn. It is a single card, after all. For example, Water decks might consider Treeborn even if they run stuff like A Legendary Ocean – how often are you hurt by your opponent taking out A Legendary Ocean, leaving you high and dry with something that is now a Tribute in hand? Treeborn Frog can also be used as discard fodder for Abyss Soldier, so it’s probably worth testing. I know the deck that I’ve been testing (that depends upon A Legendary Ocean and a few other Continuous Spells) has one major issue; those cards often hide in the deck. So if I can’t freely drop a Giga Gagagigo from hand via A Legendary Ocean, having Treeborn Frog as back up sounds promising. If you didn’t already think me insane, let me share a deck I’ve been testing on-line. Only had a few battles, but at least it can work some of the time. The concept is… different. You use Sacred Phoenix of Nephthys with Treeborn Frog… and Dark Dusk Spirit. The main goal is to constantly clear the field of Spells, Traps and Monsters. You can still play Traps for protection since Phoenix clears them for you if they are unneeded, or just use the chainable stuff like Waboku since Dark Dusk Spirit clears anything that tried to attack out of the way. It basically forces the opponent to start Setting Monsters, hoping to draw a card to remove Phoenix or Frog from the game… which is why I include cards to return them from that state. Anyway, it’s still pretty raw but it is fun. Traditional: 3/5 – This is definitely a guess. It’s based on some things I can explain though: topdecking makes you Yata-lock bait, so this gives you an annoying way to hopefully block the bird. Advanced: 3/5 – This is in general: it’s handy as a fallback for nearly any deck. A deck that specializes in using it, however, will find it’s more a 4/5. Limited: 4/5 – Defensive and tribute fodder, and what are the odds you’ll have all that many good Spells/Traps that remain in play? This seems to be a successful “downgrade” for Sinister Serpent at the moment: not as broken, still useful in general, but best in decks planned to take advantage with it. All in all, a great card I am hoping won’t become broken. Dark Paladin Yay, this is one of the coolest cards to come around in a while, and I'm basing that on the fact that I really like this card's picture...of course I speak of Treeborn Frog. Treeborn Frog is a very interesting monster with an equally interesting effect. If it exists in your graveyard during your Standby Phase and you have no Magic or Trap cards on your field, this card can be Special Summoned to your side of the field from your graveyard. Who cares right, what good is an extra 100 atk. and 100 def. monster going to do for you? Well, not a whole lot, you're right, but this card needs to be in it's own deck in order to be used properly. The first and most fitting deck for Treeborn Frog to be used in is the Frog Deck, which I'll be constructing soon in an article, so stay tuned. It can also help power up the Fusion D.3.S. Frog, which I all ready did an article about, click the link to read more. The only other deck I see Treeborn Frog fitting in is a Tribute heavy deck that uses more than the traditional two or three tribute monsters. It's a free Special Summon which never hurts tribute monsters, but feel free to use one too if you aren't having success bringing out your Jinzo, Mobius, Phoenix, etc. 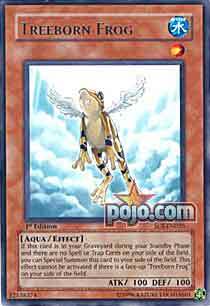 That sound you hear is millions of people simultaneously adding this amphibian to their decks. This card basically makes tribute monsters rather good as it is a free tribute every turn you haven't set an unchainable card (dagnabit, they banned Time Seal). I'm sure many articles will be written about him and his greatness. All I shall add is that Mobius is now godly, and that this is NOT Sinister, in any way, and should not be blindly added to every deck. A card that has caused much controversy lately as well as being recently banned despite the restrictions of its own effect. Treeborn frog simply rewards over extension and is simply superb for players like me who blow out their hand in one turn. Treeborn frog saves us so0o0o0o much. Seen as the replacement for sinister, in some cases this is its superior. Treeborn frog loves Soul control and other tribute oriented decks. Its only downside is its minor restriction where you cant special summon it if you have a s/t on the field. For this reason Stall cannot benefit from it, and neither can conservative players. To put it simply , Treeborn fog can only axel in specific decks. Its effectiveness varies with the player. Traditional : 4/5 for simply owning the CED Yata lock. Advanced : 5/5 Depending on the deck. "You have to run it, he is a staple." So since I have gotten one I have been running him. He is not broken, and sadly he does not go into every deck. I also do not understand why he was limited. His effect stops full field abuse. Nonetheless, this card is cool. It looks cool and scares a scapegoat token and skull servant with his godly 100 att. He also works great with graceful and merchant. I love Band-aids and think his potential should be explored. I do not believe he is for every deck, simply because Return from the D.D. and warrior rush, anything looking to win in the first 5 moves, makes him useless. Also, smile at all of your opp. who rams a D.D. Warrior Lady into this card. Or smashing ground him and att. you with a kycoo. Hence he becomes a one for one that probably did something else. Not Broken, but definitely COOL. Coin Flip I honestly hope I don't have to tell you everything this card can do. Used properly, this card is an insane advantage engine that allows players to do things they should not be allowed to do, like gain 1-3 advantage a turn consistently. It is ridiculous with Sacred Phoenix of Nephthys, it's an intense advantage engine that requires a lot of skill and careful deckbuilding to use properly, and it's just plain good. You only need one of this beast unless you're going to the SJC this weekend. Don't bother collecting. The card works really well. Use it with Book of Moon and Enemy Controller to ensure chainables. Use it with Dust Tornado, Time Seal, Jar of Greed, whatever. Just use it. Spiritual Water Art – Aoi is a fun one. Or Raigeki Break. This card is the most intensely powerful addition to our card pool in what seems like forever… Yet it can't be abused in the same fashion as Pot of Greed or Delinquent Duo. This card is potent in the hands of a potent player and lacking elsewhere. It is well-designed. This is what Sinister Serpent should have been. This card does not deserve a position in your deck automatically, but it's damned close. Just… Potent. Just plain potent. You can't abuse multiples very easily anyway because of a restriction placed upon the card itself, yet it's STILL being restricted April 1. Just wow. The best monster to be released since Cyber Dragon. Its uses are near limitless: discard fodder, tribute bait, a continuous wall, potential for +1 every turn, morph bait, the list goes on. I could go over ever use, but that would be pointless, if you don’t know them I’m sure that other reviewers will cover them, or you’ll find them out eventually. I’m too busy working on a banned list article. The main comparison is the Frog to the Snake. Well although they are similar IMO they both go towards solving different problems. The Snake is infinitely times better as discard fodder, he’s what made TIV so devastating, meanwhile the Frog is only good for one use. The frog’s main strength though is tribute fodder, the snake could be but it required a turn of being set each time, meanwhile the Frog instantly comes back. This is huge, I don’t think I can stress how good that is, you essentially get Monarchs at LV 4 each time. Even with the restriction to one I personally don’t see much hindering this card being used and abused by skilled players. He’s just that good.